Eight local agencies who advocate for community causes are launching a new partnership that will push for economic, social and racial equality through the development of a green economy in Buffalo. 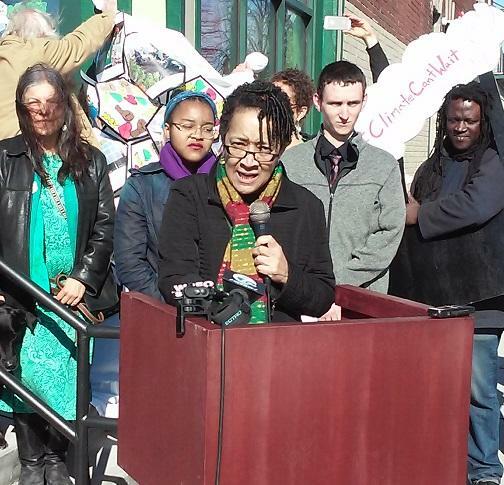 What is known as the Crossroads Collective was introduced in a Thursday morning news conference on West Utica Street at the “Five Points” intersection. The alliance will seek to raise grassroots support for the transformation of Buffalo’s economy by creating jobs with “fair pay” and promoting self-sufficiency through investments in renewable energy, urban agriculture, water management and weatherization. 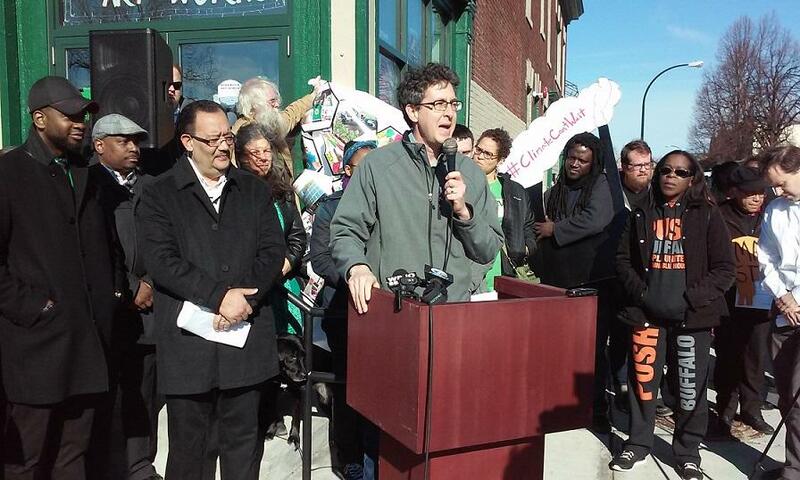 Sam Magavern, co-director of the Partnership for the Public Good, speaks during a news conference that introduced the Crossroads Collective, an alliance of eight local agencies seeking social equality through the development of a green-friendly economy in Buffalo. Several structures within the West Side neighborhood where the news conference was held underwent recent rebuilding to become more green-friendly. Members of this new coalition insist it can work elsewhere in the city, too. Advocates with the Crossroads Collective say lower-income homes end up paying higher utility bills because the quality of their housing stock forces them to consume more energy. Skeptics might suggest that the conversion to renewable energy sources, particularly solar, has one major obstacle: the high cost of refitting a home or building. Members of the collective say that’s changing. “The cost of wind and solar have been just plunging in the last five years,” said Sam Magavern, co-director of the Partnership for the Public Good. “In a lot of parts of the country, they’re cheaper than coal. That’s why you see things like the Huntley coal plant being retired here in Western New York. In addition to the PPG and PUSH Buffalo, agencies participating in the Crossroads Collective include the Coalition for Economic Justice, Massachusetts Avenue Project, Open Buffalo, Public Accountability Initiative, Ujima Theater Company and WASH Project. Lorna Hill of the Ujima Theater Company speaks during Thursday’s news conference to announce the launch of the Crossroads Collective. The Ujima Theater Company’s Lorna Hill explained how the arts plays a role in the collective and in its campaign. Buffalo Common Council members David Rivera and Ulysses Wingo were present to lend their support. Helping the new alliance get started is a financial gift from Boston-based Chorus Foundation, which has committed an eight-year, $500,000 grant to the Crossroads Collective. This entry was posted in clip, press, Uncategorized and tagged crossroads collective, green, justice. Bookmark the permalink.